Short hair is having a moment. This week, Jennifer Hudson, Kristin Chenoweth and Pamela Anderson all dared to do what we sometimes only threaten: they cut their hair into stylish short pixie cuts. They have joined the likes of Halle Berry, Michelle Williams, Gennifer Goodwin, Robin Wright and Emma Watson, making Team Short Hair that much more alluring. Thinking about making the snip? Tempted to go to your stylist and give them permission to change your identity? I want to give you three reasons why you might want to consider it. Robin Wright cut her hair in preparation for her role as Claire Underwood in House of Cards. Her character is not your usual politician’s sidekick. She is determined, strong and confident. She walks in step with her husband’s drive and ambitions, as well as having ambitions of her own. Her short hair is the perfect look for this character. It’s a “power” look that makes you take notice. Pamela Anderson has been pigeon holed into voluptuous California girl her entire career. By cutting her hair short, it gives her an air of maturity. She looks stronger, defined more by who she is as a person as opposed to her over-sexed persona. Her new look is a remarkable change and an amazing statement about the next chapter of her life. Maybe it’s a no-brainer, but short hair is easier. 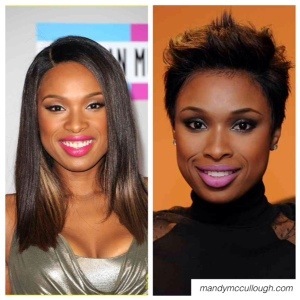 Beyoncé and Jennifer Hudson are women who juggle career and new babies. Their new short looks can simplify their personal prep, giving more time to the valuable things in their lives. Have you ever felt like all you do is throw your hair back in a pony tail every morning? What if in the same time you could create a fashionable statement with your hair? Sometimes I feel like short hair acts like an accessory in that it’s easier to style it to our mood and day. Even when you’re in sweats shuffling kids around, picking up groceries and running errands, you can feel like you have a little umph to your look. This can be scary or empowering. Be fearless with your identity! Let people see you are more than the hair style you’ve worn since high school or college. Switch it up. If you’re hesitant to let it all go, go shoulder length at your next hair appointment. Keep people guessing. Who you are as a person is what stays consistent. Your outward persona can change with the chapters of your life. Many times people put us in a box, trying to stereotype who we are. 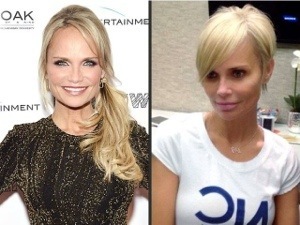 Changing your hair can bring new opportunities in your life that you never imagined. In conclusion, I’m super excited to see these women fearlessly change their hair styles. These celebrities are setting a trend, so we can bet we will see more of it in the next couple of years. Will you join the club? If going pixie seems too much like the bad dream of forgetting to get dressed, go to a bob. But have the courage to do something daring! Hair grows. I promise. Find some images of women with styles that empower you and take the inspiration to your stylist. They will help you create a new defining moment! Add Jennifer Lawrence to the list! 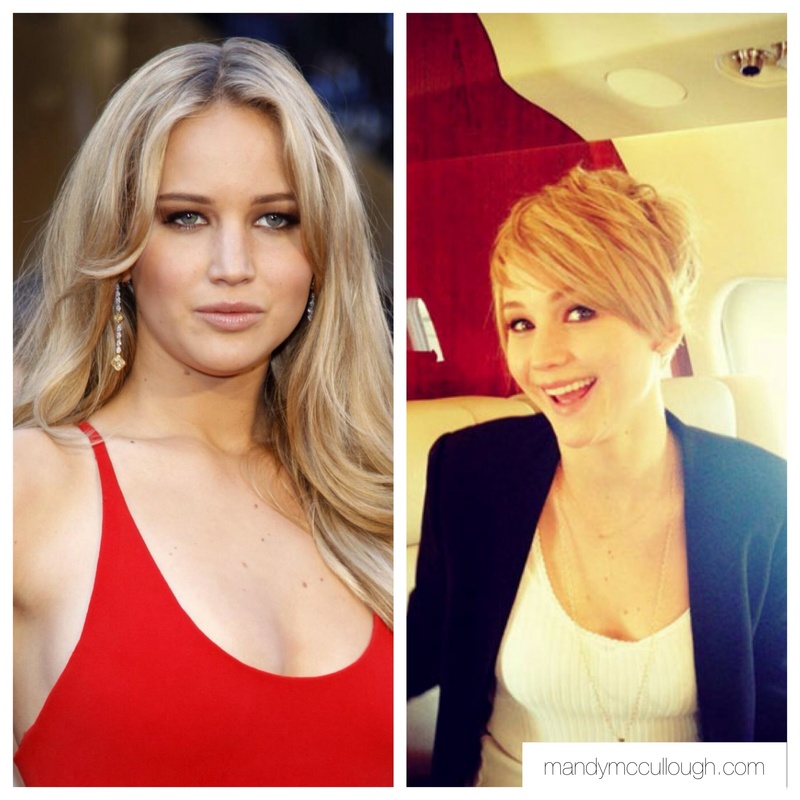 This entry was posted in Hair Style, Trends and tagged Celebrity pixie hair, cutting hair short, jennifer hudson hair, kristin chenoweth short hair, pamela anderson short hair, pixie hair styles, robin wright hair, short hair by Mandy McCullough. Bookmark the permalink.